Nellie’s All Natural Laundry Detergent gives off a very vintage vibe, and for good reason. Not only does it come in a metal tin, it is also a powder detergent, which you just do not see much of in today's day and age. This brand currently has a 4.5 star rating on Amazon, and carries the badge for "Amazon's Choice." But does it really work? Only way to know is to break it down! In today's day and age, we need something to remind us of the good old days. Nellie’s All Natural Laundry Detergent is exactly that. It comes in a tin box and look like something straight out of the '50s. It does not include any harsh chemicals and comes in a powder, instead of a liquid or pod form. This can be great because it allows you to control exactly how much you use and you end up using a lot less per load. This of course compared to liquid detergents, which are easily overused. Nellie’s All Natural Laundry Detergent is only made up of 5 total ingredients. The majority of them are derived from salt, which is why this is considered a laundry soda, much like baking soda, rather than a detergent. The ingredients include: Soda ash, linear alcohol ethoxylate, sodium chloride, sodium metasilicate, and sodium carbonate. Now, the only concerning ingredient in this whole list is the linear alcohol ethoxylate. This is because one of the byproducts of ethoxylation is 1,4 dioxane, which is a possibly carcinogen. The EWG gave it a C rating, for some concern in the categories of asthma/respiratory, skin irritation, developmental and reproductive toxicity, and cancer. However, the ingredient itself has not been observed to be mutagenic, carcinogenic, increase skin sensitivity, or cause developmental or reproductive effects. Rather all the concern lies in its byproduct of 1,4 dioxane. It is unknown if the ingredient is contaminated with that in the process or not. However, I would assume not. While a scent is not particularly needed when it comes to laundry detergents, it is definitely welcome. Many people believe that if your clothes do not come out smelling like flowers or citrus, that means they are not clean. This is not true in the least, but because it has been ingrained in our minds for so long, it is still a good idea to use a fragrance in your detergent, from a business standpoint. So, Nellie’s All Natural Laundry Detergent did not include a scent in their detergent, so you will be smelling the clothes as if they were just bought...sort of. The best thing about this detergent is that it is completely free of any and all chemicals. 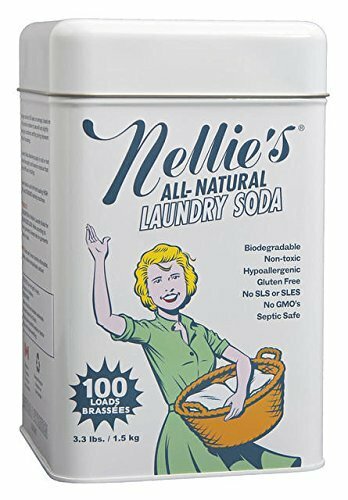 Nellie’s All Natural Laundry Detergent contains no phosphate, chlorine, ammonia, petroleum solvents, butyl, glycol ether, brighteners, SLES, SLS, or EDTA. Buying natural products can often be expensive. However, with Nellie’s All Natural Laundry Detergent, you will not have to worry about breaking the bank. Not to mention that you will not be forced to buy a new tin very often. This is because with this brand, a little goes a long way. Using one tablespoon of Nellie’s All Natural Laundry Detergent is most likely going to be enough. On smaller loads, you can even useless. This translates into using cents per load. While the price factor is a big contributor to your overall choice, the biggest by far is how effective this detergent is. This is where things start going a bit downhill for Nellie’s All Natural Laundry Detergent. One reviewer did an in depth comparison between this brand and Charlie's Soap and found that Charlie's Soap was much more effective at removing stains like blood and grass. In addition, they mentioned that Nellie's did not remove all of the cleaner smell from her rags used by her cleaning lady. So it seems that Nellie’s All Natural Laundry Detergent may be good for general laundry, but not tough enough for stains or to get concentrated smells out of clothing or rags. Because this is essentially baking soda, there is a very low environmental impact here. Nellie’s All Natural Laundry Detergent does not include any harsh chemicals in their product, which means that there will not be any chemicals being washed away with the waste water after each load. Unfortunately, the company page for Nellie's All Natural is currently undergoing maintenance, so I was unable to find out much information about the company as a whole. However, Nellie's was started by a woman by the same name....hence the name, and the company has been around for quite some time. From their Amazon page, it is apparent that their product line consists of dryerballs, fragrance sticks, laundry nuggets and more. And all of their products are free of harsh chemicals, irritating toxins, phosphates, and many are hypoallergenic. Nellie’s All Natural Laundry Detergent is natural and biodegradable. When you use Charlie’s Soap, you won’t be adding harmful chemicals to the environment or your septic tank. This laundry detergent is extremely cost-effective. Make sure you use the correct amount and this soap will last you a long time. A short ingredients list makes for a simple, yet effective product. Not to mention that the powder design makes it easier to manage and last longer than liquids. A byproduct of the Linear Alcohol Ethoxylate is 1,4 dioxane, which is a very concerning chemical product. However, it is uncertain if it is actually present in this product. It seems that Nellie’s All Natural Laundry Detergent is great for general laundry, but not so effective on tough stains or smells. If you rarely struggle with strong smells or tough stains, this brand should work very well for you. However, I would recommend maybe contacting the brand to check on the 1,4 dioxane to be sure that none of it is in this product, as it is a very damaging chemical. Nevertheless, Nellie’s All Natural Laundry Detergent may just be the product to remind you of a simpler time. Overall, Nellie’s All Natural Laundry Detergent seems like a decent laundry detergent. Free of harsh and toxic chemicals, except for one issue. Also it doesn't seem to be too great with stains or smells, but for general cleaning, it looks like it can handle the job. If you want to try it out for yourself, you can grab a 3.3 lbs tin on Amazon for $18.99. For any other information, including the best natural laundry detergent, check out the rest of Green and Growing. Here are some top questions that I found for people seriously considering buying the Nellie's All-Natural Powdered Laundry Detergent. Will this work in cold water? Yes, it will work the same in any temperature water. Can I put this powder in the detergent dispenser? No, the instructions state to add it directly in the water.